Here are a few common questions when purchasing or converting handicap vans. If you have any further questions for us, contact us at 1-800-880-8267. 1. What type of vehicles do you convert? Visit our wheelchair van inventory to see what we have in stock. We are able to convert any late-model Chrysler Town & Country, Dodge Grand Caravan, Honda Odyssey,Toyota Sienna or Ford Transit minivans. We specialize in wheelchair vans but there are modifications for sedans, pickup trucks and specialty vans. 2. Will you take my non-accesible or handicap vans on trade? Yes. We will accept accessible and non-accessible vehicle trade-ins. 3. Should I buy a vehicle first and then bring it to AMS Vans? No. Often regular auto dealerships are not familiar enough with mobility conversions to ensure your purchase of the correct model for converting. As mobility specialists, we know which vehicles are easy to modify, as well as knowing where to shop for the best prices. Give us a call at 888-880-8267, and we'll discuss how to best purchase your new handicap accessible vehicle through reputable dealers. 4. Should I buy a new or used wheelchair accessible van? While new vehicles offer new warranties and special APR financing, a used handicap van with a new conversion can offer some of the same dependability at a lower cost with a lower depreciation amount right off the lot. In addition, all of our used accessible vehicles are put through a 134-point inspection to ensure the highest quality. We also feature used trade-in vehicles with used accessible equipment for more choices when cost is an issue. 5. How long will it take to get my new accessible van? Once mobility funding has been arranged, we can schedule your delivery. Converted vans that are ready to go often take 1-to-5 days for delivery. Converting a mobility van can take up to 5 weeks, and add an additional 2 days if additional mobility equipment is being installed, so keep this in mind if you have conversion work to be done on a vehicle. 6. What if I don't like the wheechair van when I recieve it? 100% satisfaction guaranteed. If you don't like the mobility van when it's delivered, then we take it back, no questions asked, and give you a refund. 7. Can I rent an accessible van before buying it? 8. What happens if I don't need my wheelchair van anymore? We offer several options to make selling your handicap van as effortless as possible. Our prior customers are able to list their vans for the first month free on our website using our accessible vehicle classified ads. We also offer a mobility consignment program--we'll sell your van for you in exchange for 10% of the selling price. Finally, we offer a handicap van buy back program where will purchase your wheelchair van directly from you at a fair wholesale value. 9. How much does ana ccessible conversion cost? $12,980 to $17,980 for any Dodge or Chrysler, $18,980 for a Honda Odyssey and $12,980 to $21,980 for a Toyota Sienna. Depending on if you need, side entry or rear entry will determine the final price. 10. Why does an accessible conversion cost so much? Major modifications are required in order to make a vehicle wheelchair accessible. AMS Vans puts a lot of work and detail into your new mobility vehicle. 11. Is there a deposit required? We require a 10% deposit fee to hold an accessible van for up to 3 weeks. During those 3 weeks, your deposit is fully refundable. On a vehicle conversion, it is $3,000 to start the work and final payment is due at pick up or delivery. We accept Visa, MasterCard, personal or cashier checks and wire transfers. We will take a personal check for the deposit, but not the final payment. 12. What is the warranty policy for AMS Vans conversion? The AMS Vans handicap van conversion warranty is separate from the vehicle's OEM (Original Equipment Manufacturer) parts warranty. Most of our conversions come with a 3 Year or 36,000 Mile warranty and 5 Year or 50,000 Miles on the Floor structure. The warranty begins after the conversion has been completed by the manufacturer. 13. Does the AMS Vans conversion warranty policy void the manufacturer's warranty? No. The original warranty offered by the manufacturer should still be valid. 14. Do you offer an extended warranty on your vehicles? Yes. Contact one of our mobility specialists for more details at 888-880-8267. 15. Who services wheelchair vans? Customers in the metro Atlanta or North Georgia area may bring their vehicle directly to our 100,000-square foot facility. Our nationwide customers can call our 24-hour hotline at 1-888-860-2473, so that we can assist you in finding an approved service center to work on your mobility van in your area. 16. Do you provide technical manuals for service providers? 17. Do you provide an owner's manual for your accessible vans? Yes. We provide a manufacturer's manual for the van and a manual for the conversion parts. 18. Why can't I order the mobility equipment and install it myself? For your safety and protection, we follow industry guidelines to install all handicapped equipment to ensure that it is done properly. Making sure any and all mobility equipment is installed correctly is imperative to your safety, as well as others on the road..
19. 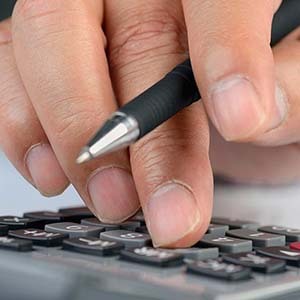 Are there any fees not included in your advertised wheelchair van prices? There are no additional fees except for delivery and that is based on your location. 20. Why does AMS Vans sell wheelchair vans over the Internet directly? We save you money by cutting out the local mobility dealer and selling to you directly. The World Wide Web allows us to reach customers who cannot physically make it to one of our locations. Also, our conversion vans are most often for wheelchair passengers and not those individuals wanting to drive from their wheelchair, which allows us to sell our handicap vans directly to you online and save you money. 21. How do I purchase an accessible van from your website? It's as simple as contacting us via email or by calling 1-888-880-8267. One of our mobility specialists will have you in a wheelchair accessible van in no time. 22. Do you have "Web Exclusive Sales or Specials?" Yes. We conveniently highlight our specially priced accessible vehicles in blue. You can also visit our Wheelchair Vans on Sale page. Our promotions change weekly, so don't miss out on the deal of your dreams. 23. What does it cost to have my accessible van delivered to me? Please refer to our front door delivery information and click on your state for local pricing. 24. Will you pick up my vehicle for conversion or do I have to bring it to you? Yes. We will pick it up with a transportation fee, which is the same as our delivery fee. Please refer to our handicap van delivery information, and click on your state for pricing. Our delivery price to you is the same as the pickup rate. 25. Do you have a local mobility dealer? We are building our nationwide mobility dealer network and may already have a mobility agent in your state. Until then, we offer nationwide delivery and service in all 50 states, and we also deliver handicap rental vans nationwide for long term delivery. Sell used vehicles direct for a great price, free nationwide pick-up, and quick cash. We buy modified wheelchair vehicles of all types. Let us value your used car, truck or SUV today! 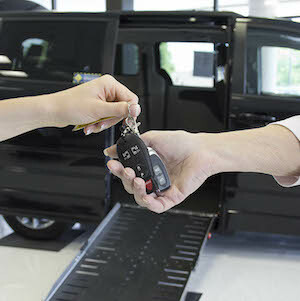 We'll take your trade in as a down payment towards your next wheelchair accessible van. We offer a great buy back program. If you no longer need your AMS Vans-brand handicap van, we are happy to buy it back from you. 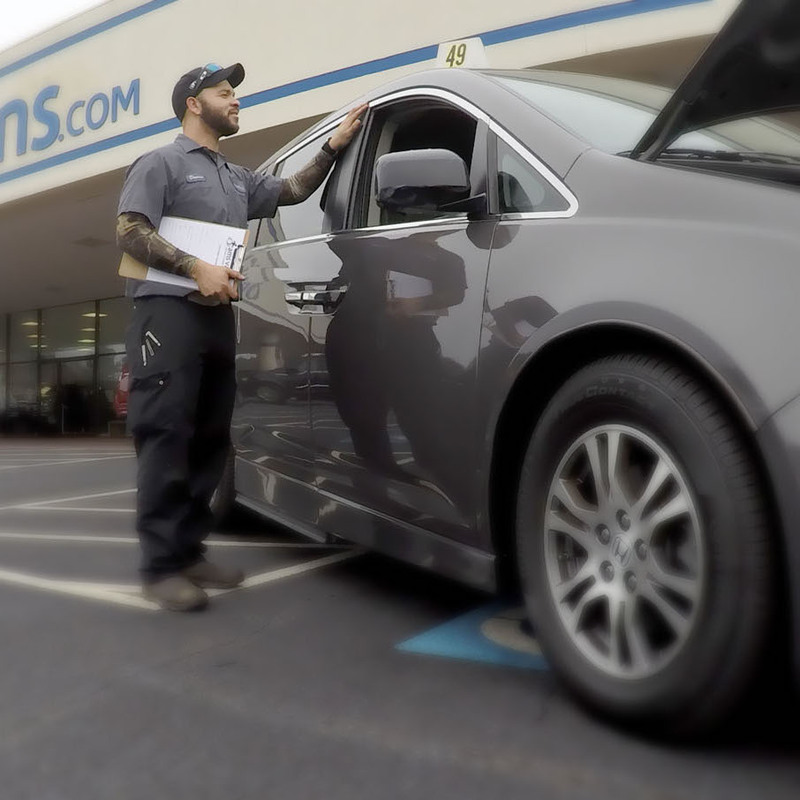 AMS Vans handles nearly the entire process of selling your accessible vehicle after we have certified it. You keep your title until sale.